SevenStarHand.org exposes the truth about ancient symbology and the profound wisdom it encodes. October 24, 2010	(Newswire.com) - For most of the last two millennia, Christian Rome oppressed and terrorized myriad souls for simply trying to understand the truth. Mr. Buddy Page, also known as "Seven Star Hand," reveals that even the present Vatican has been desperately struggling to prevent most people from ever understanding the whole truth about ancient symbols, but especially stars and angels, and the profound disproof and insights they encode about pivotal symbol and ancient mysteries. Deeply controversial, SevenStarHand.org was created to prove the truth behind the symbols of ancient wisdom. Former software engineer, Buddy Page, also known as "Seven Star Hand," is the author of the book Finishing the Mysteries of Gods and Symbols. For the last decade, Seven Star Hand has been deeply involved in researching and reverse-engineering the symbology evidenced throughout the Hebrew canon and derivatives, which is easily shown to have come from ancient Egypt and even before. These ancient symbols and the wisdom they encode are also a pivotal focus of Freemasonry. This is why those involved in similar esoteric endeavors over the centuries were so violently opposed by Christian Rome and why Freemasonry is still feared by the Vatican. Though Mr. Page is not a Freemason, his research proves that religious assertions about Freemasonry are mostly well-orchestrated lies and purposeful misdirection. SevenStarHand.org delivers redundant evidence that ancient wisdom symbology was based on very precise science and natural observations that decisively prove its true meanings and purposes. He points to comprehensive proof that the symbolism common throughout many ancient texts, cannons, and concepts is an advanced and extremely ancient spiritual and philosophical technology that predates all extant religions and mystery schools. Throughout his book, Finishing the Mysteries of Gods and Symbols, Seven Star Hand also presents verifiable proof that ancient sages and prophets opposed religion and wisely never trusted religious leaders. "The head in sand pose may temporarily hide danger from the ostrich, but the hungry lion has no misconceptions about the truly dire nature of that bird's predicament." Here is verifiable proof that ancient symbology is an advanced long-lost technology," says Seven Star Hand. 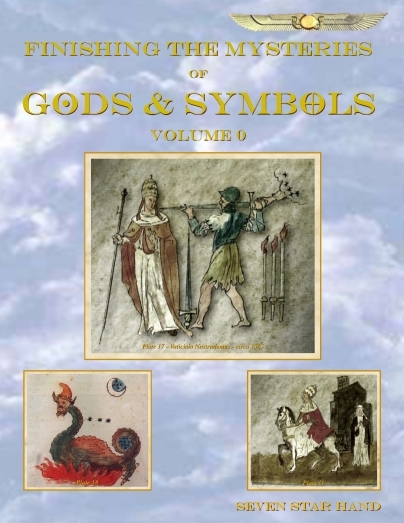 SevenStarHand.org offers links to download the Free PDF e-Book version of Finishing the Mysteries of Gods and Symbols. The paperback is also now available through Amazon.com and CreateSpace.com and soon, everywhere else. Can science and ancient wisdom work together to unlock the mysteries of the ancient past and prove the truth about all religions? Visit http://www.sevenstarhand.org and prove it to yourself.